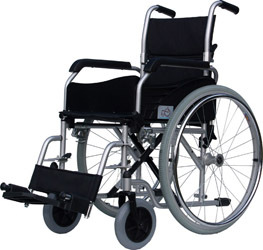 The Excel G2 Self Propelled Wheelchair is a solid steel chair that comes comes equipped with a good range of features. With a half folding backrest and Quick release rear wheels (fixed version available), it can still fold up to be very compact. It also comes with swing away armrest fitted as standard making side transfers simple. Half folding backrest to help save space when not in use.